View of a cove on the Farallon Islands. Public domain photo by Duncan Wright. The U.S. Fish and Wildlife Service has extended to June 10 the deadline for accepting public comments on a controversial proposal to eradicate nonnative house mice on the Southeast Farallon Islands. The agency hosted a public meeting on Thursday, May 12, as the first step in drafting an Environmental Impact Statement (EIS) for the proposed project. Also on hand for the meeting were representatives from PRBO Conservation Science and Island Conservation. PRBO biologists have been conducting research on the Farallones since the 1970s, and Island Conservation is a nonprofit focused on eradicating nonnative species from islands around the world. In April USFWS announced it was considering air-dropping pellets of a highly toxic rodenticide called brodifacoum on the islands. Several groups have voiced concerns over using the poison, which can harm or kill other creatures that either eat the pellets directly or consume poisoned rodents. Wildcare, a longtime Marin wildlife advocacy and rehab group, has launched a substantial public campaign arguing against the proposal. At the May 12 meeting, Refuge Manager Gerry McChesney emphasized that no decisions have been made regarding which method will be used to eradicate the mice; however, the bulk of the meeting was spent discussing the pros and cons of using an anticoagulant poison called brodifacoum to achieve the agency’s goal. It’s not surprising that the plan faces opposition. Allen Fish of the Golden Gate Raptor Observatory says the poison affects not only raptors and other birds of prey but foxes, bobcats, cats, and dogs. On the mainland, it’s a major problem because it has long been readily available, and it is especially pervasive in urban areas, where people use it to control rodents around homes and other buildings. In 2008, the federal Environmental Protection Agency approved restrictions on the use of brodifacoum to certified pest applicators, and banned the poison in home improvement stores. That regulation is set to go into effect this June. Ashy storm-petrels are small seabirds that nest on the Farallon Islands. Public domain photo by Duncan Wright. The Farallones, a series of small rocky islands about 30 miles west of San Francisco, provide a refuge for 13 seabird and five marine mammal species. Although project proponents say the entire island ecosystem would benefit from the rodents’ removal, the biggest winner would be the ashy storm-petrel, a secretive seabird that nests on the island. The ashy storm-petrel is listed as a California Species of Special Concern and is labeled “red” on the Audubon Society’s Watch List. About 2,000 storm-petrels nest on the southern Farallones, approximately half the world population. But in the last several decades, the Farallon colony has declined by 30 to 40 percent, and the house mice are at least partly to blame, mostly because they attract burrowing owls. Burrowing owls like this one, near the Berkeley Marina, are the subject of preservation efforts on the mainland. On the Farallon Islands, they threaten breeding ashy storm-petrels, another imperiled species. Creative commons photo by Doug Greenberg. Burrowing owls are but one species of many migratory birds that make a pit stop on the Farallones on their way to their winter homes. Most migrants only stay a day or two, but a “smorgasbord of mice” has been enticing the owls to extend their stay through the winter. When the first of the season’s rains flood mouse burrows and send the mouse population plummeting, the owls turn to an alternative food source: ashy storm-petrels. According to Pete Warzybok, a PRBO biologist who has been studying seabirds on the Farallones for over a decade, 15 or 16 burrowing owls spent the winter on the islands last year. “A few owls can take a lot of petrels in a short time,” says Warzybok. Critics are quick to point out that gulls also kill plenty of petrels; in fact, western gulls account for 60 percent of predation, versus 40 percent by burrowing owls. “That’s true,” says Warzybok. “But there are 18,000 gulls on the Southeast Farallones, and only a handful of owls.” In other words, bird for bird, the owl has a much greater impact on the storm-petrel than the gull. The mice might also be impacting the petrel directly. The robin-size bird nests in underground rock crevices, returning to land on dark, moonless nights, probably to avoid predation by gulls. The ashy storm-petrels live a long time–one banded bird lived at least 36 years–but reproduce slowly. Each bird doesn’t necessarily breed every year, and they never lay more than one egg per clutch. Only half of eggs laid result in a fledged chick. Warzybok’s team uses a fiberoptic camera at the end of a flexible tube to peer into petrel nests. Without catching a mouse in the act, the cameras have revealed the next-best evidence: petrel eggs marred by suspicious teeth-marks. “If we go by what we see on other islands, direct predation is likely,” says Dan Grout, a project manager for Island Conservation. On Triangle Island in British Columbia, for example, deer mice were shown to prey on auklet eggs. Most people at the meeting seemed to agree that ridding the Farallons of house mice is a good idea. But is brodifacoum, a highly toxic rodenticide, the best or only choice? Rodenticide bait has been used to eradicate rats and mice from hundreds of islands around the world. Two cases–Anacapa Island off the coast of Southern California and Rat Island in the Aleutian chain–reveal both pros and cons of such programs. Anacapa Island, part of Channel Islands National Park, had been overrun by black rats since at least the early 20th century. The rats preyed heavily on seabird eggs, particularly those of the Xantus’ murrulet. In 2001-2002 Island Conservation partnered with the National Park Service to eradicate the rats from Anacapa. It was the first aerial broadcast of brodifacoum in North America. The situation on Anacapa was complicated by the presence of an endemic rodent, the Anacapa Island deer mouse, which was just as susceptible to poisonous pellets as the targeted black rats. The solution? The team held a number of deer mice in captivity and treated Anacapa’s three islets in phases, moving some mice to the refuge of the untreated island while treating the other islands. Ten years later, Anacapa’s seabirds are thriving. Populations of the native deer mouse have returned to normal. Any deer mice that weren’t protected died, as did all of the rats and at least 94 birds, which died either from consuming rodenticide bait directly (primary poisoning) or from scavenging rat and mouse carcasses (secondary poisoning). Most of the avian victims were songbirds. Raptors and owls emerged from the project relatively unscathed, in part because an organization called the Predatory Bird Research Group transferred 37 birds of prey off the islands prior to treatment. Ten years later, Anacapa’s seabirds are thriving. The hatching success of Xantus’ murrulet has soared 350 percent and three new colonies of Cassin’s auklets have formed. Populations of the native deer mouse have returned to normal. Download PDF about the eradication of black rats from Anacapa. The Rat Island eradication, though it could also be considered a success, it certainly was not an unmitigated one. Norway rats had ruled Rat Island for over 200 years, ever since a Japanese ship wrecked on its rocky shores. Though burrow-nesting seabirds like puffins and ancient murrelets are common residents on nearby rat-free islands, they were completely absent on Rat Island. The rodent’s reign ended abruptly in 2008 when refuge managers, the Nature Conservancy, and Island Conservation teamed up and decided to bombard the island with 46 tons of brodifacoum pellets. A monitoring crew recovered 422 dead birds, including 320 glaucous-winged gulls and 46 bald eagles. Most of the birds tested positive for brodifacoum. The campaign worked, but not without heavy collateral damage. A monitoring crew recovered 422 dead birds, including 320 glaucous-winged gulls and 46 bald eagles. Most of the birds tested positive for brodifacoum. Rotting rat carcasses probably attracted many of the victims to the island. Gulls died after either eating pellets directly or from scavenging dead rats; eagles most likely died from eating poisoned gulls. Because the number of non-target victims far exceeded predictions, the partners commissioned the Ornithological Council to conduct an independent review. The resulting report cited use of excessive bait and deviations from the strategic plan. The original plan called for two applications of brodifacoum pellets. The “bait rate” of the second round (measured in kilograms per hectare) was supposed to be half that of the first (presumably because there would be fewer rats to feed on the pellets); however, the bait rate of the second application actually exceeded that of the first, in part because the field team made a hasty decision to dump 11 tons of “contingency bait” on the island just before leaving. The report also notes that collecting rodent carcasses after the baiting program could have prevented the island from turning into a deadly buffet for scavengers. Download the full report. Then there’s the question of the rodenticide itself. Brodifacoum is classified as a “second-generation” anti-coagulant. It is highly effective, meaning it is highly toxic; typically a rodent eats it once and dies. The poison persists in animal tissues, increasing the risk of secondary poisoning. Other, less toxic rodenticides have been used in eradication programs, notably a first-generation anti-coagulant called diaphacinone. Because it isn’t as lethal, two or more applications are required to get the job done. So could diaphacinone be used on the Farallones? According to Brad Keitt of Island Conservation, diaphacinone acts on mice and rats differently. Mice require a much higher lethal dose than rats; in addition, mice tend to be “neophobic,” that is, they are reluctant to consume large quantities of an unfamiliar food. In other words, using diaphacinone may not kill every single mouse on the Farallones. And there are quite a few mice on the islands. Warzybok says biologists from Island Conservation have run trap lines to determine the density of the rodent. The tests revealed the highest numbers the organization has ever seen. Assuming that brodifacoum is a better weapon of choice in the case of the Farallones eradication project, bait stations might protect at least some non-target animals from directly consuming rodenticide, but Keitt favors aerial broadcasting. Using bait stations would require transposing a grid over the entire island and placing stations at regular intervals. Since house mice have small home ranges, the grid would have to be very small, with stations no more than 25 meters apart. House mice also defend their territories, and could prevent other mice from accessing bait. Consequently the stations would have to be checked and restocked with pellets for a minimum of two years. By contrast, aerial broadcasting assures that every mouse has simultaneous access to the bait, which improves the likelihood of killing every single one. Keitt says brodifacoum doesn’t pose the same danger as a chemical like DDT: Although brodifacoum persists in animal tissues, he says, it does not bioaccumulate like DDT, nor does it linger in the environment in its toxic form. “It’s highly insoluble in water,” says Keitt. Water sampling on Anacapa calmed fears that the rodenticide would leach into the marine environment. Instead, brodifacoum binds strongly to the sediment, where microbes transform the poison into carbon dioxide and water. He also points out that treating the island would be a one-time event, whereas the chronic use of rat poison around homes and farms on the mainland continually exposes creatures to harm. If the EIS process determines that aerial broadcast of brodifacoum is the way to go, planners would time the project for late November or early December, when the mouse population is at its lowest (requiring a lower rate of rodenticide) and fewer birds are on the islands. Officials are also looking into the possibility of trapping as many burrowing owls as possible and transporting them to the mainland. Western gulls would be the most likely victims of secondary poisoning. Once the mouse is eradicated, the islands may respond in surprising ways. Proponents of the plan say the house mouse likely helps spread weed seeds, including those of a non-native grass that forms dense mats and clogs potential habitat. With the house mouse gone, the native vegetation should rebound. 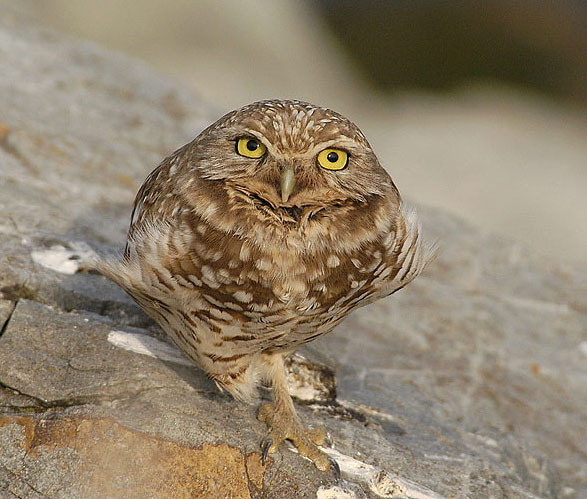 Ellie Cohen, executive director of PRBO, says the absence of mice might be better for the burrowing owls in the long run. “The Farallones is not a good place for owls or other migrants,” says Cohen. “Other than the non-native mice, there’s not a lot of food for them there.” In winter, the islands become an “ecological trap” for the owls that stay. According to Warzybok, petrels don’t provide the same nutritional value to owls as mice. Some of the wintering owls become weak; some even die. Cohen points out that either way, animals are going to die, and humans are ultimately accountable for those deaths. Once the public comment period ends in June, the USFWS will begin drafting the EIS, after which the public will have another opportunity to comment. The agency hopes to complete the process by fall of 2012. Find information on commenting here. Juliet Grable is a freelance writer with one foot in southern Oregon and another on a sailboat in Sausalito. Why Do Turkey Vultures Have Red Heads?